Established in 2014 by a three-year grant from the Ball Brothers Foundation, the Building Better Neighborhoods (BBN) Initiative connects Ball State’s resources with neighborhood development efforts across Muncie and Delaware County. Building Better Neighborhoods received the Key Award for Service Program of the Year at the 2018 Prosperity Indiana Summit. 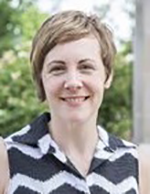 hlwilliams@bsu.edu Heather Williams serves as Ball State University’s Building Better Neighborhoods Program Manager, working directly with the city’s neighborhood associations to help build capacity and make connections with BSU faculty, staff, students, and programs. She holds three degrees from BSU, a Bachelor of Arts in History and Masters Degrees in Business Administration and Urban and Regional Planning. Heather worked as a Planner within the City of Muncie’s office of Community Development with both the Unsafe Building Hearing Authority and the Department of Housing and Urban Development’s Neighborhood Stabilization Program 3. In utilizing NSP3 funding to revitalize a section of West Main Street within the Old West End neighborhood, she gained a greater understanding and passion for neighborhood based revitalization efforts. Heather also worked as a code enforcement officer within the City of Muncie’s Building Commissioner’s office before joining Ball State’s Office of Community Engagement. She is actively involved in local housing issues as President of the Board of Directors of ecoREHAB of Muncie, Inc., Treasurer of the Muncie Land Bank, and member of Pathstone Housing Corporation’s Advisory Board and the 8Twelve Coalition’s Steering and Housing Committees. Heather also serves as Task Force Chair for the Muncie Action Plan and is President of her neighborhood association. She has been recognized as a Finalist by the Muncie Star Press for the 2015 Person of the Year Award and is a 2016 M Magazine 20 Under 40 Honoree. In her professional and non-profit work, Heather advocates for strong neighborhoods, safe – affordable housing, and sustainable living. afant@ballstate.bsu.edu Aimee Fant is Neighborhood Coordinator for Muncie Action Plan, Executive Director of Cancer Services of East Central Indiana-Little Red Door, is Co-Founder of Muncie Matters, is a writer/photojournalist, served as a former public educator through Muncie Community Schools at the Youth Opportunity Center and a Delaware County CASA (Court-Appointed Special Advocate for Children). Fant was born and raised in Muncie, has 3 children who she has chosen to also raise in Muncie and attended Ball State University. She has served as Co-Director twice and produced content for 5 separate interations of “The Facing Project”, is on the Delaware County Drug Task Force and on the Healthy Communities Alliance for Delaware and Blackford County. She is among a team of collaborative community organizers whose efforts are to help Muncie realize and live up to its full potential. The Muncie-Delaware County Economic Development Alliance represents a consortium of economic development entities dedicated to the growth and prosperity of Muncie-Delaware County, Indiana.